Feel the magic like never before as Disneyland® Paris turns spectacularly sparkly to celebrate the 25th anniversary! 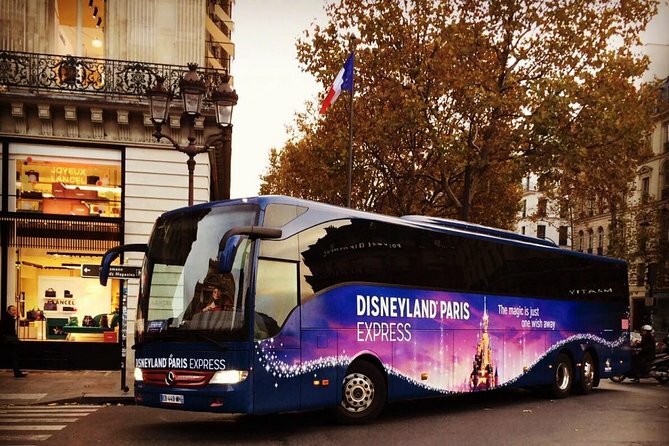 Come on board the Disneyland® Paris Express shuttle for a magical time. Experience includes transportation from Paris and Disney® Parks ticket (Disneyland® Park and Walt Disney Studios® Park). - Please be at the meeting point 15 minutes before your tour departure. - Tickets are given in the bus, not at Disney® Parks. - Eiffel Tower Stop only available from April 1rst until October 31rst, From December 21rst to January 6th, and all summer from March 1rst 2019 until October 2019. Choose option including Eiffel Tower departure. Something sensational is taking over Disneyland® Paris. Prepare to go starry-eyed as a celebration of 25 years of magic in the making transforms Disneyland® Paris into a spectacularly sparkly surprise. During this extraordinary year, stars will illuminate the sky above magical kingdom, glistering with the glow of a thousand stories. Classic tales shine brighter than ever and new adventures twinkle to life, lighting the way to a dazzling display that can only be found in Disneyland® Paris. Take advantage of the opportunity to live the magic like never before. The Disneyland® Paris express shuttle offers a new way of getting from the center of Paris to the Disney® Parks. This package includes transportation and entrance to the Disney® Parks. Disneyland paris is very far from my hotel, and i couldn't be happier without the help of this tour. Very easy and stress free. I would recommend. Totally recommended, had a great time !!! Super convenient and hassle free journey to Disneyland. Highly reccomend! Very fun experience! It is a shame that the shuttle doesnt leave after the fireworks however. It was a last minute decision and I was lucky. The tour dropped us at the Disney park and then picked us from the part in the night. Unfortunately we had no way to see the fireworks display as the pick up was after the fireworks. So be sure to get to the bus without waiting till the fire works. The bus pickup is nice and the Skip the line Entrance tickets. Their are lots of people, so be prepared to stand in line for rides. THe fast pass is also not a biggie. If you've swiped it once for a ride you must wait almost 3 hours before you can swipe it again for another ride. So you can go and plan a few rides in time sequence and think you can use your fast pass for them all. It doesn't work like that. Thus we've swiped our fast pass for Buzz lightyear ride at 17:50 this was at 12:00 and we couldn't use our fastpass again before 15:10. SO we standed in line like the rest of the visitors. Fast pass a waste. I wanted to visit Disney all my life and the visit made me feel that this experience is way overrated. The coach was not really labelled properly and the instruction on how to find the stops is vague. The tickets are handed to you in the bus and that's it. Well worth getting it if you want to avoid the queue to getting the tickets in Disneyland but there is also a train from the center of Paris and it brings you directly to Disneyland. My recommendation is to take the train. This was our first visit to Paris so we didn't know about the transportation options so we booked this tour. The shuttle bus was crowded and longer than a train ride. In addition, there was only one departure time. We ended up taking the metro back. Disneyland was great!